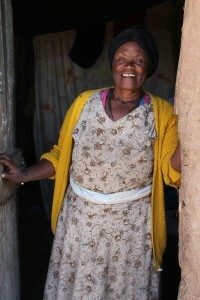 This month, we bring you an interview with Dema Kecha, age 67, a mother and grandmother who lives in a small village in a rural area outside of Addis Ababa, Ethiopia where our local partner Emmanuel Development Association (EDA) has worked for many years. 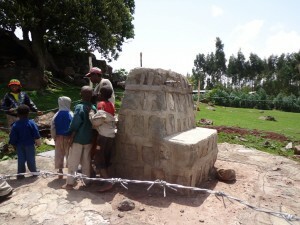 Most recently, and after countless delays for government approvals, contractors to fulfill the requirements properly, and community resources committed to completing it, EDA was able to bring fresh water to Gelan Idero – alleviating an extremely long and often hazardous walk to a dirty river that residents had no choice but to use as their single source of drinking, washing, and water for animals and crops. The community chose to halt water distribution until they had a chance to fence the water points to protect them from damage. 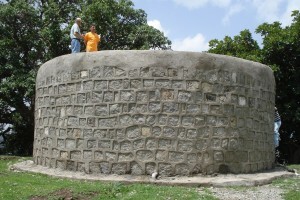 Country Rep Gebriel Galatis and M&E Manager Faisal Islam standing atop the 50,000 litre reservoir.